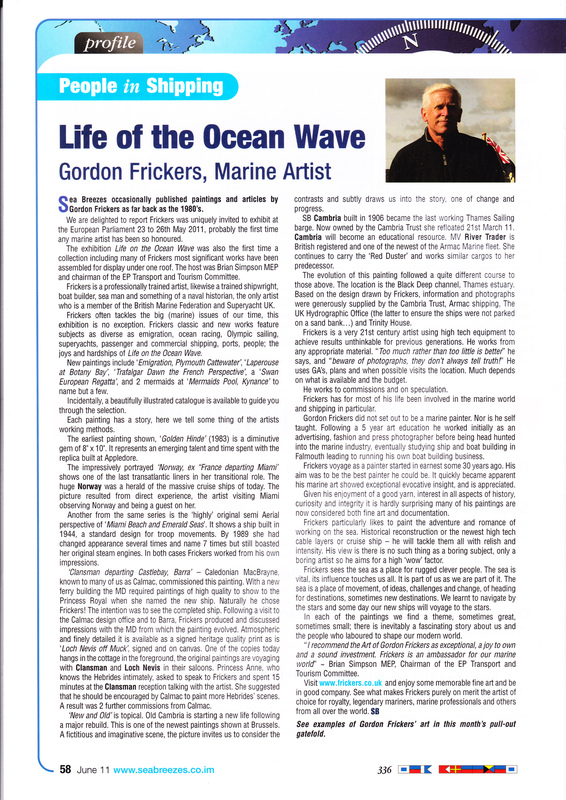 The press and media often cover and benefit from stories about my work as an artist, painter. Here are a few examples of the high quality, high echelon and outright entertaining fun coverage: enjoy ! 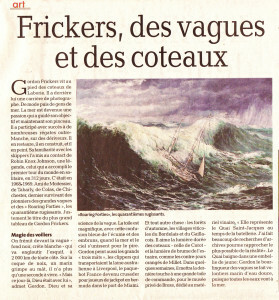 Ladepeche (art) 19.08.14 “Frickers, des vagues et des coteaux”. 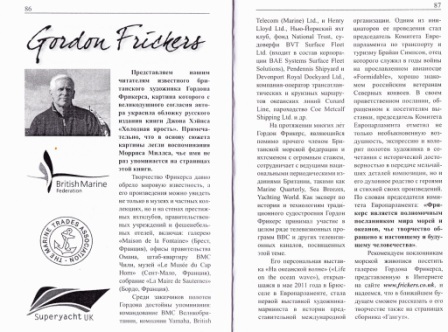 WIFR ~ The magazine’s avidly read Odin’s Eye leader delivers salty views that make government ministers and civil servants wince, while also providing food for thought in the top echelons of naval forces. 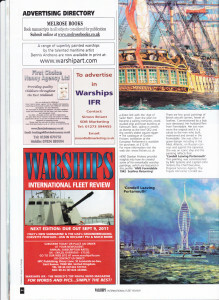 Since its foundation in 1998 WARSHIPS International Fleet Review has evolved into the world’s leading and only high street naval news monthly magazine of its kind. 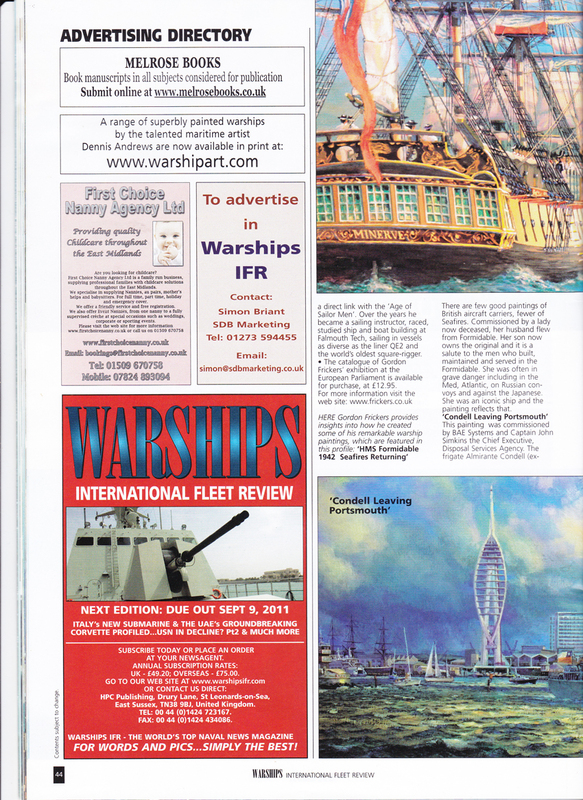 The primary aim of WARSHIPS IFR is to provide a forum for the navies of the world. 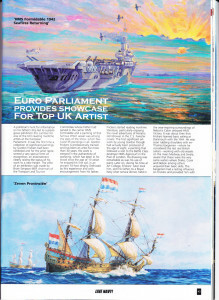 “Artist captures winner, instantly”, “his on the spot painting”. “near the library Observe Gordon Frickers the renowned marine artist at work”. 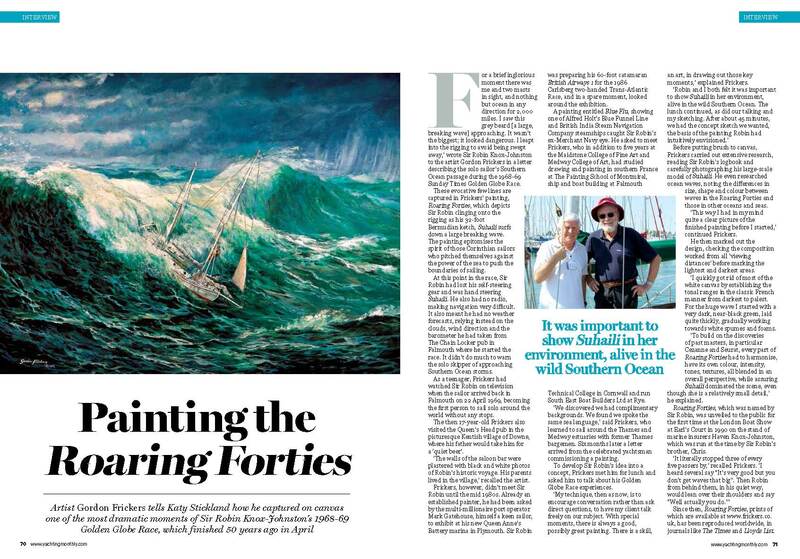 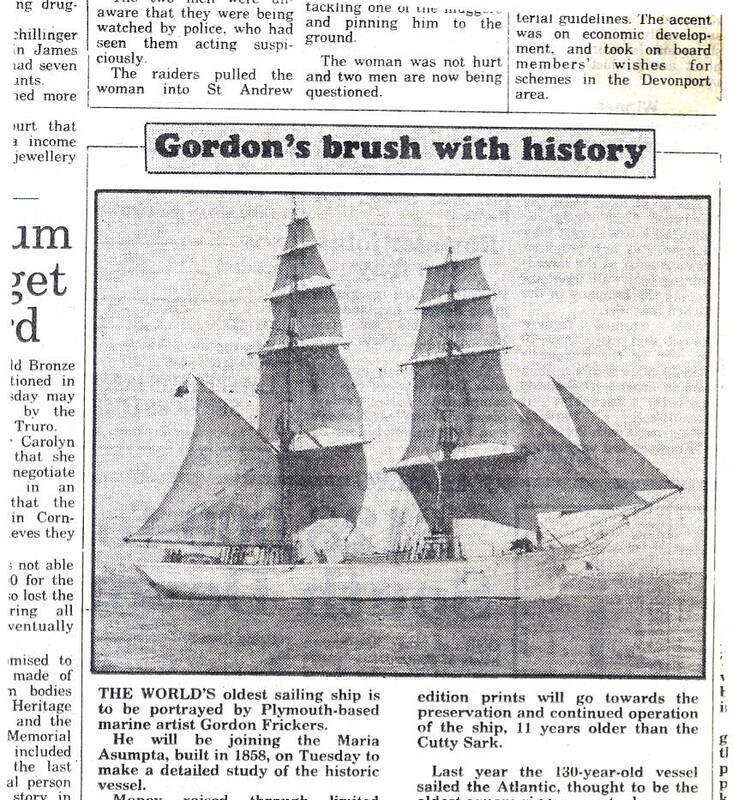 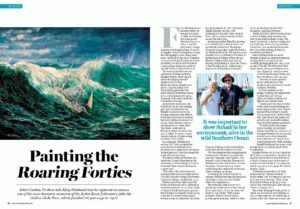 “Gordon captures the Nexus”, “commissioned to record the cableship Nexus on canvas for BT Marine”. “Breathing new life into Chester’s old port”, “a near perfect example of a mid Victorian port”. 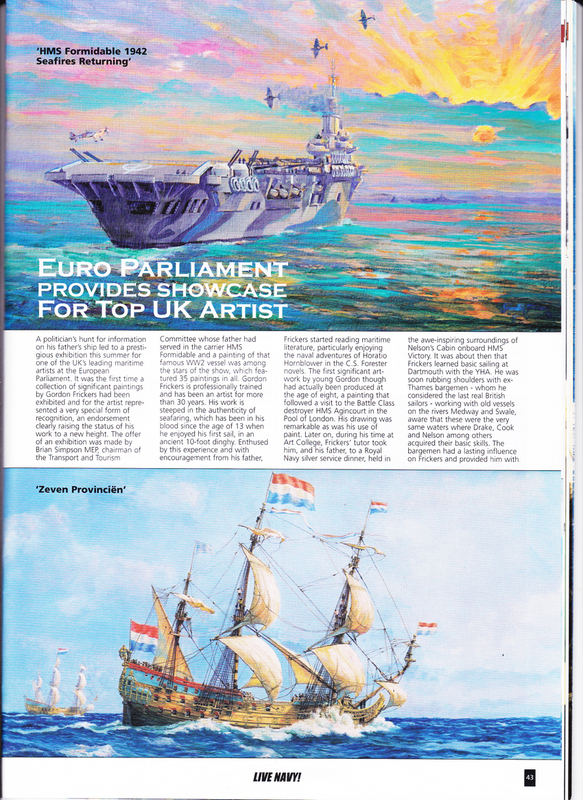 “vision of the future” “commissioned by the STA to paint the ship”. 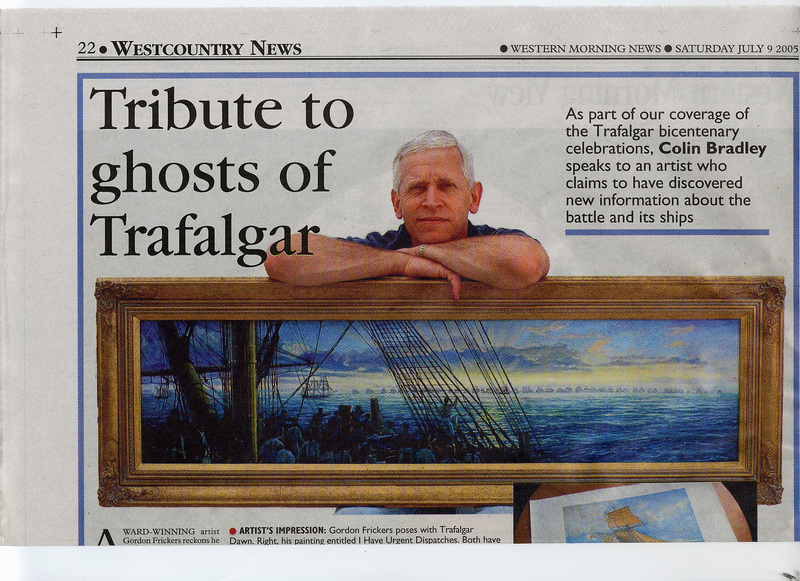 Two new prints have been released by marine artist Gordon Frickers to mark two very significant points in the Trafalgar story. 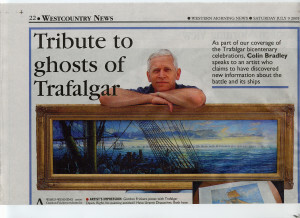 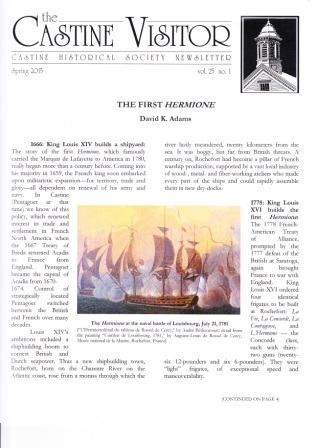 ‘Trafalgar Dawn‘ interprets history to depict the view from HMS Victory at five minutes past six on October 21, 1805, when officers where awoken by the cheering of the crew on deck. 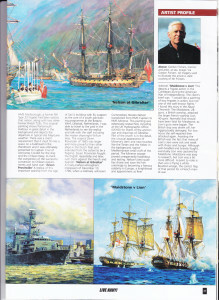 ‘I have urgent dispatches‘ … leaps to the aftermath and the tiny HMS Pickle conveying the news of the victory at Trafalgar and Nelson’s death. 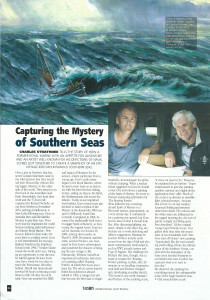 Royal Geographic Society 11 September 2012 – (on the Geography Directions Web site), IBG Journals and Geography Compass, Wiley-Blackwell’s review journal covering the entire discipline. 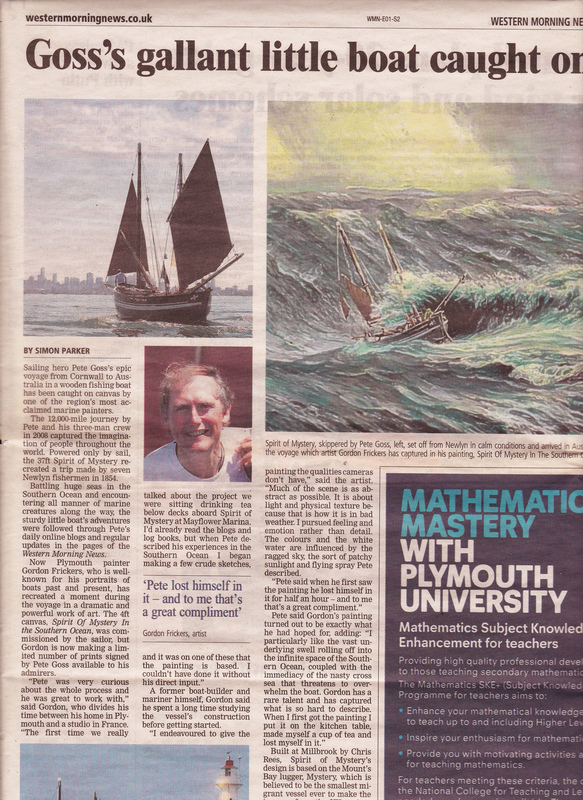 Dr. F. Ferbrache who specialises in current imigration/emigration wrote an assesment of the painting Emigration, Plymouth Cattewater. 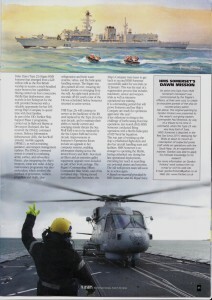 Warships International Fleet Review, April 2013, part of an article on ‘New war fighting prowess in HMS Somerset’s DNA. 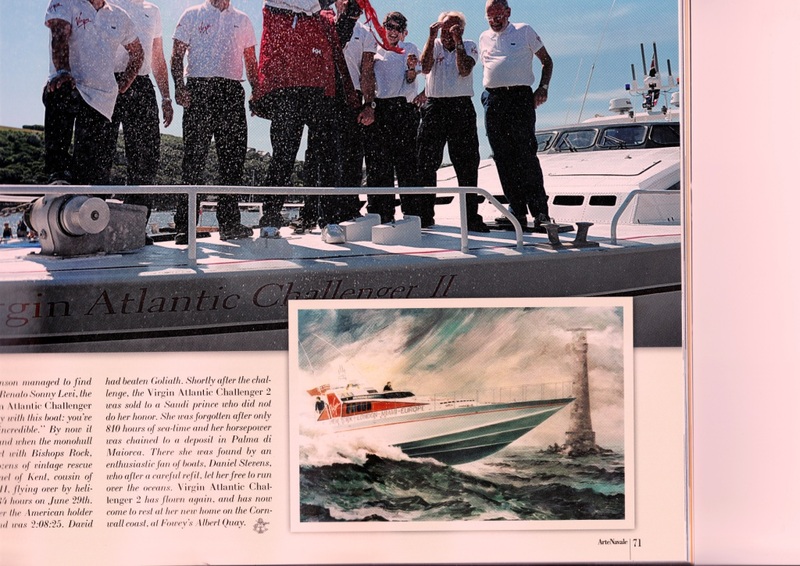 Arte Navale, February 2014, a quality Italian magazine, part of a 4 page article on Richard Branson’s Atlantic Challenge. 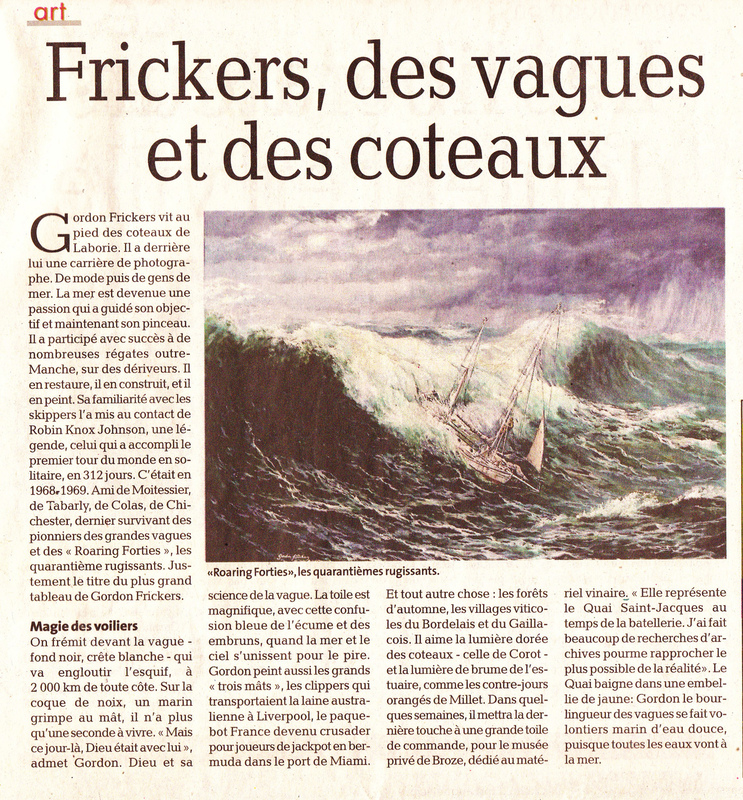 Le Cashier Loisirs, 24 April 2014 – 3 page article on the new wine museum at Broze near gaillac, Invincible Vigneron. 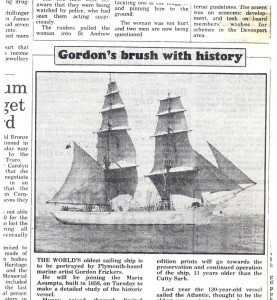 La Depeche, same day similar article. Bow Wave Issue 696, 11 June 2015 article about the last engine less square riggers. 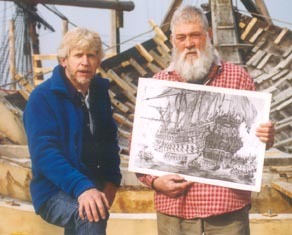 Enjoying your visit? 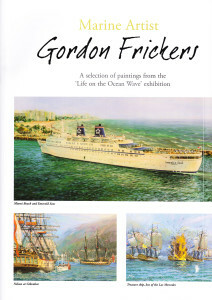 Found something you like? Share with friends.